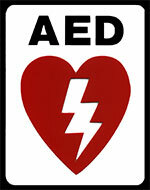 State law requires that the local EMS agency be notified when an AED is placed in a location. This is done by completing the online AED registration. If you do not find your location register your AED. More than 160,000 American's suffer a cardiac arrest every day. Currently, a person who suffers Sudden Cardiac Arrest in the US, outside of a hospital, has just less than 10% chance of survival. For every minute that passes before returning the heart to a normal rhythm decreases the chance of survival by 10%. In communities with programs ensuring widespread CPR training and Automated External Defibrillators (AEDs) have improved survival rates from cardiac arrest by up to 60%. Thank you for wanting to place an AED (Automatic External Defibrillator) in the community. On September 8, 2015, SB 658 was signed into law. This bill revised several of the laws regarding civil liability for placement and use of AEDs in the community. Report Use of AED to EMS agency within 24 hours (Click button above to access form). CPR certification and training of at least one employee during business hours is no longer required.